We reserve only select rooms and suites, rigorously chosen from the best hotels and villas, directed to perfectly accommodate your wishes. 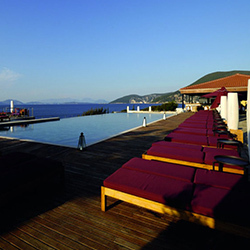 The Emelisse Hotel is situated along the rugged shoreline of the emerald Ionion Sea. It sits in a spot of supreme serenity amongst acres of native cypress and cedar trees on the beautiful island of Kefalonia. The pools and outdoor restaurants and bars provide front row seating for an unparalleled display of nature’s splendour. In a private valley, engulfed by nature’s picturesque surroundings, overlooking the grandeur of the Ionian Sea in the south eastern corner of Kefalonia in the beach resort of Skala is situated the Tesoro Blu Hotel and Spa. An exclusive accommodation where modern minimalistic design meets pure island landscapes and creates the aura of a tranquil escape from reality. Architecture is the canvas where people can experience natural beauty through a design strategy that encourages interaction with physical environment. Consistent with these beliefs, Leivatho Hotel brings its spirit and values to the hotel world, creating an innovative concept with a high degree of eco-functionality and friendly aesthetics. Situated on an idyllic peninsula and in harmony with its surroundings, the pine forest and the emerald Ionian sea, this beachfront Luxury Hotel in Kefalonia offers the perfect setting for a relaxing and memorable holiday. 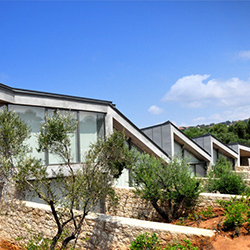 A modern hotel in Kefalonia. 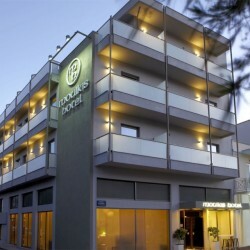 The hotel is located in Argostoli, the capital town of Kefalonia Island since 1757. 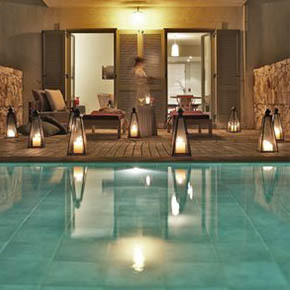 The full renovation completeted recently (April 2011) has rendered the hotel a true oasis of hospitality.